PLEASE NOTE: THIS ITEM CANNOT SHIP VIA 3-DAY DELIVERY.Sharpened hardened cutting teeth can be replaced when worn. Pneumatic wheels allow you to roll for transport, instead of carrying it. Size: 14"D x 6'L with a hot dipped galvanized steel frame. Pull chain provided on front, hooks on rear for drag mat to attach. You can remove the wheels to turn the groomer over and use as a leveling sled. 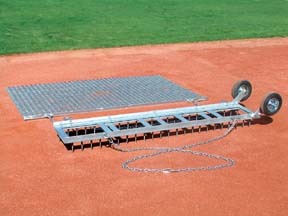 Combo includes the Diamond Digger with wheels and a 6' x 4' drag mat. Freight to Hawaii or Alaska, as well as expedited shipping costs, will be quoted to you by email for your approval before the order ships.Please note that this item cannot be shipped internationally.